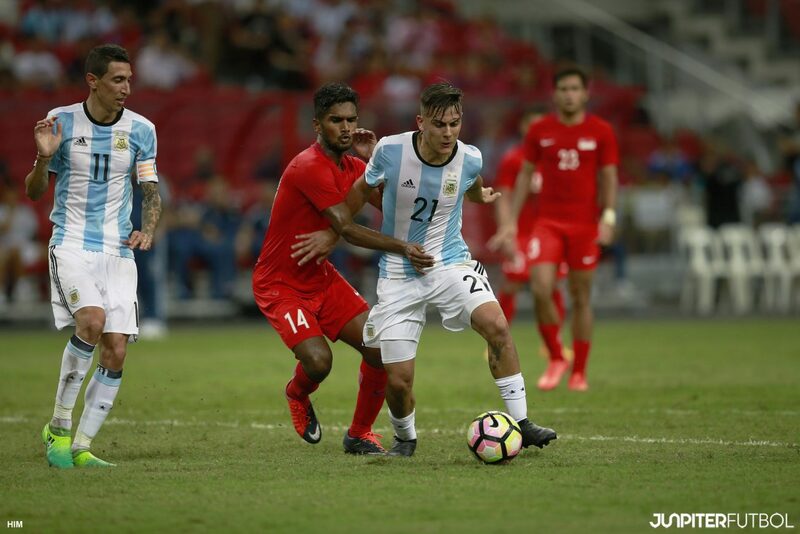 Argentina strolled to a convincing 6-0 win over Singapore amidst the humid weather earlier this evening with Federico Fazio, Carlos Correa and Angel Di’Maria all getting on the scoresheet. Despite missing the likes of Lionel Messi and Nicolás Otamendi, fans were entertained by the fancy footwork of La Albiceleste, particularly that of Paris Saint-Germain midfielder Di María and the industry of Paulo Dybala, who plies his trade with Juventus in the Italian Serie A.
Argentina had a number of chances in the early minutes of the game and they must have been frustrated by Hassan Sunny’s series of saves off chances from Di’Maria, Marcos Acuna and Carlos Correa within the first ten minutes. Dybala went for the spectacular in the 14th minute when he let fly from range and it must have taken Hassan every muscle in his body to leap far enough to palm the midfielder’s shot away. A.S. Roma loanee Fazio finally broke the deadlock on ten minutes later when he slotted it past Hassan and Correa added just before the half-hour mark to ensure that Argentina headed into the break with a 2-0 lead. Jorge Sampaoli made two changes heading into the restart when he brought on Ever Banega and Lucas Alario in place of skipper Lucas Biglia and Correa, and the latter nearly scored after spending just seven minutes on the pitch, stretching to meet Di’Maria’s cross in the box but failing to get enough of his foot on the ball to jab it home. Hassan overstretched himself while making a clearance and had to be replaced by Izwan Mahbud and he did well to scoop up the ball quickly from an Argentina counter-attack to deny Alario. Alejandro Gomez capped off a brilliant team move by blasting it into the roof of the net in the 61st minute and substitute Leandro Paredes rocked the upright with a stinger nine minutes later. Paredes would extend Argentina’s lead further less than a minute later, cutting past Faritz Abdul Hameed before nestling the ball into the bottom corner of the net. Both teams seemed to tire out heading into the final quarter of the game and they spent a good 15 minutes stroking the ball around the park before a moment of brilliance saw Di’Maria head a ball down to Alario, who blasted it past Izwan in the 89th minute. Di’Maria turned from creator to scorer three minutes later, practically walking the ball into the net with a deft backheel after Ignacio Fernandez’s low cross had the entire backline beaten to top off a fantastic performance from the South Americans. Singapore Head Coach V. Sundramoorthy spent about ten minutes with the press in the post match conference this time around, taking his time to answer several questions. “We were playing against one of the top teams in the world and the boys tried their best. They learned some good lessons from the opponents in this game and we hope that this will help us as we move on.” said the 51-year-old. When asked to elaborate further about what the Lions had learned from the Argentinians, Sundram answered: “You could see how superior (Argentina) were in their penetration and passing. They were very comfortable on the ball.On the other hand, we conceded 2 goals from set plays and we need to see how to improve on this.”. Sundram also seemed vexed when asked whether he would be re-looking his selection for the next 2019 Asian Cup Qualifier against Turkmenistan, based on what he had seen from his current players against Chinese Taipei and Argentina. “If we were Brazil, I think I would have no shortage of players to call up. But this is Singapore. Would you be able to name me any other players who are more suitable?” said the former Singapore international.